Abstract: LCD's don't suffer from the same parameters that can cause that kind of eyestrain, they draw a substantially lower amount of power, and they take up just a few inches of desk space. ViewSonic are one of the largest display manufacturers in the world, and if their giant trade show hot air balloon is any indication, they are a company with a mandate to get noticed. We've devoted a lot of our previous LCD reviews to products from Samsung and Hitachi, so it will be interesting to see how Viewsonic's VG700 stands up to the standards set by those two companies we know so well. The Viewsonic VG700 should be of great interest to anyone looking for an LCD display on a budget. With its' 17" screen size, the unit retails for a competitive $700USD. CRT displays of equivalent size will always be less expensive than their LCD counterparts, but there is just something so nice about working on an LCD that makes the switch worth every penny. Displays like the VG700 tend to be easier on the eyes after an extend period of time writing, or doing other types of work on the web or in office applications. If not correctly set, a CRT with a low refresh rate can quickly tire the eyes, or cause headaches (one reason why it is important to set your CRT to at least 75Hz, or even 80Hz if possible). LCD's don't suffer from the same parameters that can cause that kind of eyestrain, they draw a substantially lower amount of power, and they take up just a few inches of desk space. But you know all that, so we won't bore you with the details of why LCD's are worth switching to. The control panel on the face of the VG700 is pretty simple, with three keys for the speaker controls, two up/down keys and then a  and a  key followed by a power button. The on-screen menu system is well laid out but the combination of the up/down and ,  keys make navigating a little tricky at times. While the keys work on a visual level, and the iconography is clear, it would have been good to label the auto adjust key something other than . 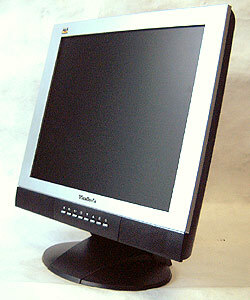 The Viewsonic VG700 is classed as a value LCD monitor because it only supports an analog video signal, and because the LCD specs are mid-range. Analog video cables have been in use for a very long time and this ensures 100% compatibility for the VG700 however. The visual qualities of an analog video connection are not quite up to par with what DVI is able to offer, but in most cases it is difficult to tell the two apart with a properly configured display. Destined for use in the home, or in an office, the Viewsonic VG700 features a small pair of integrated 3 Watt speakers in its bezel, and a pretty nice looking two-tone silver and black appearance. In addition to a display resolution of 1280x1024 pixels, contrast ratio of 450:1, viewing angles of 70/70/70/65 (U/D/L/R), and brightness value of 260 nits, the VG700 has a slightly sluggish pixel response time of 35ms. The speakers don't carry any real acoustic weight, but they are a nice addition for landlocked cubical workers looking for a low-volume source of internet radio, or other simple audio playback. A removable stand with rear tilt offers comfortable adjustments, and individuals with LCD armatures or wall mounts can make use of the 100mm VESA mounting point for zero-footprint applications.